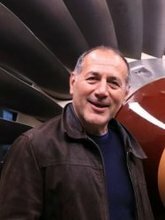 The aim of this presentation is to show the state-of-art computational aeroelasticity methods which are available for analyzing fan blades on modern civil aircraft. Fan blades in the modern high bypass aero-engine typically produce around 80% of an aero-engine thrust. In order to improve specific fuel consumption and to reduce the level of noise emitted from the engine, civil turbofan engine designs are moving toward even larger fan diameters, and hence the importance of this component of aero-engine becomes even more prominent. As the fan (and hence intake) diameter increases, shorter intakes are required to reduce the overall weight and drag of the aircraft. As a result of shorter intakes, the fan and the intake will become closely coupled and hence the effects of inlet distortions, such as crosswind, will become more important on the fan stability . Moreover, such fan blades are highly loaded and tend to operate on the flat part of the constant speed characteristic, and hence are expected to be more prone to aerodynamic and aeroelastic instabilities than conventional ones. The presentation will include flutter, forced response, buffeting and stall driven events. Furthermore, the limitations of current prediction methods will be discussed.